The amount of malware targeted at Android devices continued to grow at an alarming rate last quarter, according to report by Intel-owned McAfee. The security firm says almost all new mobile malware over the third quarter was aimed squarely at Android, jumping around 37% compared to the previous quarter. 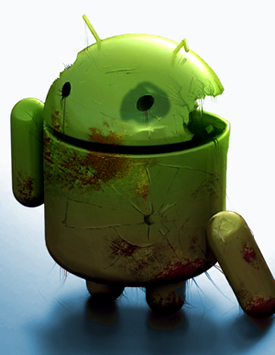 This follows a 76% rise in Android malware in Q2 of 2011. One of the most common forms of malware in Q3 included SMS-sending Trojans that collect personal information and steal money, as well as software that secretly records phone conversations and sends them to the attacker. Malware authors are capitalizing on the popularity of Android devices, but that's not to say Android users are four or five times more likely to infect their phones than they were a few months ago. As long as users stick to the official Android market and read app permissions as well as past reviews before downloading they should be 'relatively' safe -- though Google's relaxed stance on app screening on its Marketplace has been known to let a quite few malicious apps slip under the radar. It's also worth noting that although Google's mobile OS is getting most of the attention from malware developers these days, among all mobile platforms Symbian still makes up the biggest piece of the pie, with more than three times the total number of malware samples targeting it. McAfee's Third-Quarter Threats Report (PDF) also contains information on other types of security attacks affecting other platforms. For instance, the security firm says that attacks such as fake antivirus, and attacks exploiting the AutoRun feature in Microsoft Windows are still going strong, while Mac malware also continues to grow following a sharp increase in Q2. Spam levels have dropped to a record low since 2007 but targeted attacks utilizing social engineering schemes still represent a serious threat. Also, while overall botnet infections dropped slightly in Q3, they seemed to have shown a significant increase in Argentina, Indonesia, Russia and Venezuela. As for the botnets that were the most damaging, Cutwail, Festi and Lethic led the pack in Q3, while Grum, Bobax and Maazben declined.